Published May 7, 2018 at 5:12 p.m. 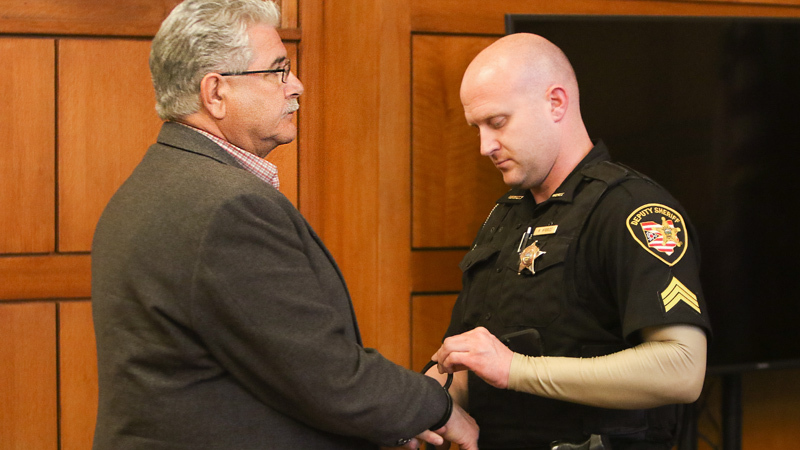 Updated May 7, 2018 at 9:02 p.m.
Photo by Robert K. Yosay | Former Niles mayor Ralph Infante will be sentenced at 10 a.m. Friday in Trumbull County Common Pleas Court. Visiting Judge Patricia Cosgrove, who presided over the 11-day trial, revoked Infante’s bond, and Infante was immediately handcuffed and taken into custody and taken to the county jail. In the first local criminal trial of a major Trumbull County public official in a decade, Ralph Infante was convicted of 22 criminal charges, including engaging in a pattern of corrupt activity throughout his 24 years as Niles mayor. Infante looked straight ahead late Monday and did not seem to react as as long string of guilty verdicts were read for tampering with records — guilty on 13 of 16. The charge carries a penalty of up to three years in prison on each count. One of the convictions said he failed to report on his Ohio Ethics Commission disclosure form that he received a gift of nearly $8,000 in 2007 — two free tickets to the 2007 NCAA Championship football game from Cafaro Co. executives Anthony Cafaro Sr. and Anthony Cafaro Jr. Neither Cafaro was charged in relation to the gifts. Infante also was found guilty of falsification for lying to an agent with the Ohio Auditor’s Office in 2015 about the tickets. Prosecutors played for jurors an audio recording of Infante telling the investigator his wife, Judy Infante, paid for the tickets, even though he told an FBI agent on a 2009 recording that nobody paid for the tickets. Infante, 62, will be sentenced at 10 a.m. Friday in Trumbull County Common Pleas Court, where his trial took place over 11 days. The jury deliberated about nine hours before reaching its verdicts. Infante could get about 60 years in prison, though prison time is not mandatory for most of the offenses. Visiting Judge Patricia Cosgrove, who presided over the 11-day trial, revoked Infante’s bond, and Infante was immediately taken into custody and taken to the county jail. Cries could be heard coming from the back of the seating area in the courtroom, where Infante’s wife and his step-daughter, Michelle Sudzina, were sitting. Sudzina testified in the trial. Judy Infante did not. In their verdicts, the jurors said Infante failed to report gambling and gift income to the Internal Revenue Service and or Niles Income Tax Department for 2010, 2011, 2013 and 2014. The most serious conviction — engaging in a pattern of corrupt activity — carries with it the potential for a prison sentence of 10 or 11 years. Prison is mandatory. Prosecutors said they only had to prove that Infante committed two corrupt acts for him to be convicted of the corrupt activity charge. From 1992 through 2015, prosecutors said, Infante participated an enterprise that involved theft in office, tampering with records and having an unlawful interest in a public contract. He fared better on five counts of bribery with the jury of six men and six women finding him not guilty on all five, including the four counts associated with city employee Scott Shaffer, who said he paid Infante four times for jobs for himself, his girlfriend, another friend and a promotion for his girlfriend. Infante likewise was found not guilty of soliciting improper compensation from Shaffer relating to two of those same allegations. Other bribery counts involving a man who said he paid Infante for jobs for his sons in the the 1990s were dismissed last week. Shaffer was initially indicted along with Infante, but prosecutors dropped the charges after Shaffer agreed to testify against Infante. The jury found Infante not guilty of accepting a bribe from city employee Terry Clay, who told jurors in videotaped testimony that he removed trees from a home Infante owned in exchange for a job for Clay’s friend. The jury found Infante guilty of two counts of theft in office that apparently relate to the sale of scrap metal by city employees and other city-owned property. Infante was found guilty of four gambling counts involving block pools and ITAM No. 39 club, which Infante used to own; and one count of having an unlawful interest in a public contract. That offense is related to his rehiring of his brother, Joe Infante, as part of a retire/rehire program in the city. None of the attorneys in the case were willing to speak about the verdict, citing Judge Cosgrove’s gag order. Special prosecutors were Dan Kasaris and Leigh Bayer of the Ohio Attorney General’s Office. Infante’s attorney is John Juhasz. Ohio Auditor Dave Yost congratulated his Public Integrity Assurance Team, which took the lead in the investigation and provided accountants and investigators to the work, which lasted over three years. Yost also expressed gratitude for the work of the special prosecutors. Judge Cosgrove was among the parties commenting Friday and Monday on the difficult task faced by the jurors — frequently tedious, boring and complicated testimony. Over the first eight hours of deliberations Monday, jurors asked Judge Cosgrove, a retired former Summit County Common Pleas Court judge, about five questions. The jury returned about 45 minutes later with verdicts on all counts. Perhaps the last Trumbull County public official convicted of corruption was former Trumbull County Commissioner James Tsagaris, who spent nine months in federal prison on a probation violation after he pleaded guilty in Akron federal court to two counts of honest-services mail fraud in 2009. Tsagaris accepted $36,551 from a local businessman in late 2004 while serving as a commissioner and voting on matters that directly affected the businessman. Tsagaris attended part of the Infante trial. April 24, 2018 1:29 p.m.